Having an OpenTable business profile is a no-brainer choice for restaurants that require reservations. The San Francisco-based website lists over 40,000 restaurants worldwide and 21 million monthly users find a new place to eat thanks to the OpenTable platform. It’s also a major player in restaurant reviews. The company estimated that over 850,000 reviews are created on a monthly basis. Creating an OpenTable business account not only brings more exposure, but it can also increase your online reputation. Research shows that 72 percent of customers view online reviews as trustworthy as personal recommendations, and 4 out of 5 Americans will use reviews before making a purchase decision. Compared to likes and tweets on social media. Online reviews also have a longer shelf life and stay relevant for as long as three months. Here’s how you go about adding your business on the popular website. Instead of filling out the form, you can also opt to call the company directly at (866) 951-7154. The hub of your OpenTable business is the Restaurant Center page, which allows you to upload and manage various aspects of your business such as your address, reservation phone number, logo, and the closest intersection. If you need to update any information, you can do so in the Profile tab. Most changes should be updated immediately, but other alterations, such as a new profile photo, could take three to five days. You can also utilize Restaurant Center to add more details to your page. Some additions include a price range for meals, hours of operation, cuisine type, and photos (users can also add their own photos). You can also upload multiple menus as a link or document file. In terms of reviews, you’ll see the overall rating and the number of reviews underneath your business’ name. User reviews are found below the restaurant information. In addition to text feedback, diners will provide a score between one and five in the categories of Overall, Food, Service, and Ambience. Additional details for reviews are also displayed and contain a percentage breakdown based on sentiment, noise level, the likelihood of recommending the restaurant to a friend. The cumulative scores for the Food, Service, Ambience, and Value categories are also visible. The Reviews section in Restaurant Center lets you see all reviews posted as well as private notes sent by diners to your restaurant. You can also utilize the Marketing section to attract more customers. You can create Ongoing and Seasonal promotions, which are based on specific features and holidays, respectively. When you sign up for OpenTable, you will have to choose which of its three main systems is right for your business. The most basic option is the Electronic Reservation Book (ERB), which runs on a local terminal at your restaurant. In addition to handling reservations, the system allows you to see your floor plan from a bird’s eye view, which is helpful when managing table allocations for diners. There isn’t a set price for using ERB. According to OpenTable, pricing will vary based on the type of reservation, and you can see a breakdown of the costs on your monthly invoice. For a more in-depth solution, you can try the Connect service, which is available as an iPhone app or a web page on desktop and mobile platforms. Connect lets you track and accept reservations on your website, OpenTable.com, and other sites (Google, Eater, TripAdvisor, and others). Automatic confirmations are also sent to customers via email. If a customer places a reservation through your website, email marketing campaign, or on Facebook you will only pay $0.25 to OpenTable. Reservations through the OpenTable site and its partners will cost you a bit more at $2.50. Connect might also appeal to you because it has no monthly pricing, and you can cancel the plan at any time. For the full package, you can give the GuestCenter plan a shot. In addition to reservation management, you can also create shift summaries for employees, manage multiple tables, and create guest profiles. However, one of the most useful features in GuestCenter is the Reporting and Analytics section. You can integrate it with your point of sale system to get real-time revenue report and analyze turn time, which can help you seat more people at a faster rate. Depending on your available budget, the downside to GuestCenter might be the cost. OpenTable charges $1 per online reservation in addition to a monthly fee of $249. OpenTable’s platform offers you the ability to control multiple facets of your business from reservations and reviews to guest profiles and table management. However, this is just one of the many restaurant sites available to the public. In addition to OpenTable, potential customers are looking for reviews on your restaurant from other sites such as TripAdvisor, Yelp, Facebook, and Google. 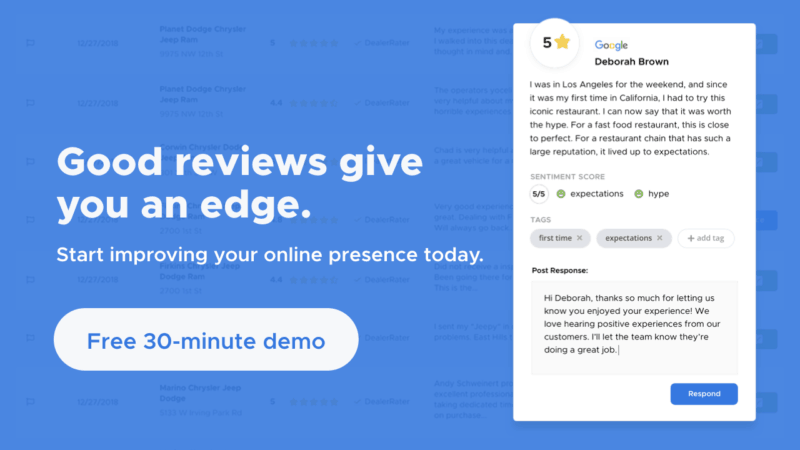 Keeping track of your online reputation and reviews across multiple sites can take a while. For online reputation and review management, you can utilize software like ReviewTrackers to save time and optimize your efforts to increase your restaurant’s online footprint.